To create stunning flash page flipping book, you may be interested in FlipBook Creator Professional. 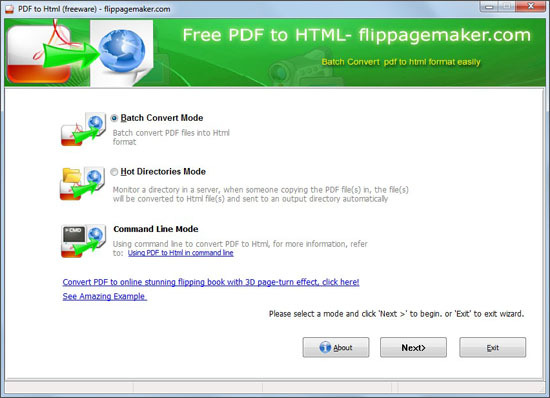 Batch Convert Mode: convert PDF multiple PDF files to HTML in a time quickly. You can also collect all the PDF files into a folder, and then import the entire folder into the freeware to convert. 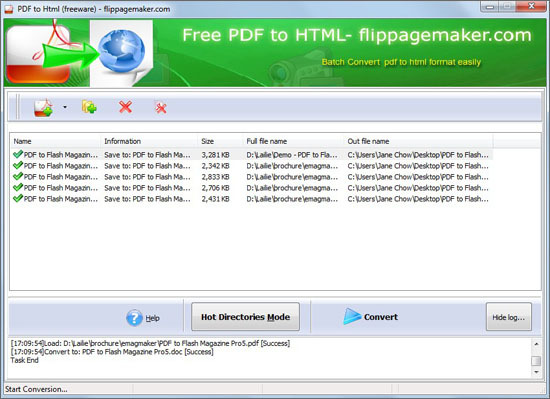 Hot Directories Mode: by setting directly, the freeware will help to automatically convert the PDF file you copying into the Input Directory. This convert mode is very convenient to use as well as Batch Convert Mode. Command Line Mode: if you can use command line skillfully, you can try the Command Line Mode. Step4, you can view and upload the HTML files. However, if you think the HTML file is not attractive enough in usually. You can try to convert your original PDF to flipping book with stunning page flipping effects. Flipping book created by FlipBook Creator Professional will support HTML5 and Web 2.0.